Highway Traffic Bike Racing is an exciting andchallengingmotorcycle racing game , Navigate your motor on a crazystreetracer track.The Traffic brings to you one of the mostcompellingand satisfying traffic dodging experience. then you haveto jointhis game, combined with realistic motorcycle physics, sothat youenjoy the speed while experiencing the realmotorcycleexperience.In this motorcycle racing game, you will havetheopportunity to drive different racing motorcycles to completemanyawesome and challenging motorcycle racing game missions.youhave togo beyond the traffic cars, trucks, buses, heavy trailers,etc., toget gold coins to buy the most beautiful and powerfulmotorcycles.As much as possible to avoid the vehicle, earn extragold coins.THE MOTO BIKE TRAFFIC RIDER Fetures :- - 4 Diffrent typeofFabulous Bikes - 3 Diffrent Type of High Graphics Seneriyo -StantViewe Fetures Also Availebel - Rear Wheel Driving - AmazingandSmooth Controls - User Flaxibility - Global Leaderboard -AmazingSound And Control - atractive camera mode How to Play: - Tapyourphone/tab on right side to race. - Tap your phone/tab on leftsideto brake. - Collect Coins from crossing the traffic by nearandupgrade your motorcycle. - Experience the thrills of realracingand stunts. Normally, you can play all types ofmotorcyclesimulator games. Most of these mobile games take place inthe cityof the world. This is also very interesting thing, but nowis thetime to put your motorcycle on the road! This road trafficrace isfor you to drive a motorbike and travel at the sametimeexperience. Yes we know that it is great. Car Racing Simulator Extreme Track is the best racing game. Bestclassic game for racing where a form to play through so many packedstreets to avoid crashes & take down traffic cars. Here youpick up coins and perform dynamic to perform high-speed aerialstunts! Here you will become to use your all to excellent drivingskills & win. Get on higher performance cars at all levels.Features of Car Racing Simulator Extreme Track: # Extremely PreciseDriving Simulator. # Easy controls mad car drifts. # Breathtakingvisuals and amazing cars. # Small size game but really goodgraphics and effects. # Upgrades and customize extreme cars. # HDgraphics. # Super fast speed. # Free & endless modes forendless fun Car Racing Simulator Extreme Track is the bestphysics-based single player & multiplayer challenging mission.Best graphics which keeps you make playing all the game in hdenvironment. Have real competition with car racing games with realtracks & real traffic racing unlock free nice cars and the testdrive to play. Play super cars with easy controls & upgradeyour turbo engine to find the optimal tune for your car. Can makecolorful paints and cool stickers for your car with the latestupdate coming is wifi multiplayer racing. Free clash racing on mostimpossible tracks with added textures and amazing 3D environments.You can drive with traffic in simple and intuitive control &have amazing 3D graphics. Select from so many cool cars in mostaccurate physics environment & easy to play. In a realisticimpossible car stunt formula racing games to play anytime where youget ultimate speed to in racing mode or on a mega ramp. Show yourf1 racing skills with exotic cars. There is no limit in playing inlevels as you play as the tracks get challenging in formula racingwith impossible tracks in that extreme time limit. You can raceamong fast-paced battles through online experience. Ger the realfeel of driving and racing on so many similar highway road. Hit theroads with awesome cars and share the experience with your friendswith the speedy formula you have got in this Car Racing SimulatorExtreme Track game Download, Play, Share and don't forget to giveus a review for Impossible Car Racing Simulator Extreme Track game. it's your time to play impossible driving games with limo car onimpossible tracks. Impossible Limo Driving Simulator Tracks Gameoffers crazy challenges on scary drive tracks that are sky-high.This off-road impossible path is made with ramps to do limo stuntsand high jumps for endless driving adventure. limousine driving ondangerous roads is full of thrill and fun. Avoid impossible fallotherwise your luxury party limo will fall down from extremeheights. Perform the crazy, thrilling and furious Limo fantasystunts by playing Impossible Driving Games on hard, challenging anddangerous tracks. It need extreme limousine driving skills to drivesafely on tricky and curvy paths. While climb up on new racingtracks you need to avoid impossible fall. This racing adventure isa endless scary drive. 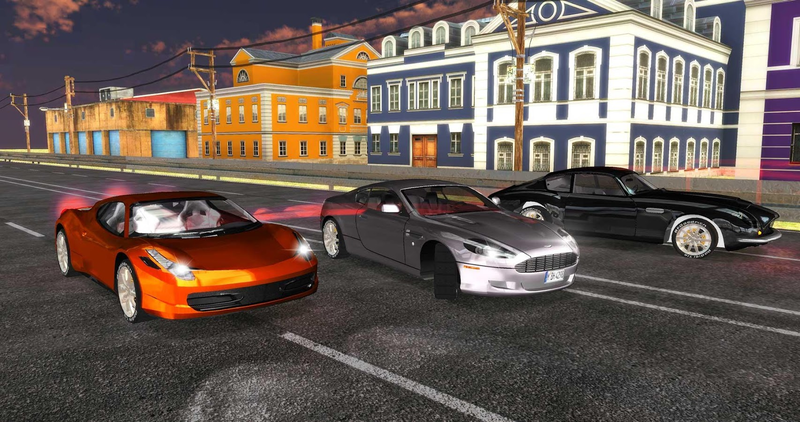 Impossible Driving : Limo Car SimulatorTracks is the most difficult crazy stunts game. As a responsibledriver put your seat belt to face the fear of death and performcrazy stunts in this luxurious car driving game. Accept theimpossible challenge of dangerous driving. Impossible Driving :Limo Car Simulator's Features: - Real life stunt mania game -Mid-air stunts and sky high driving tracks - Luxury Vehicles withreal stunt cars on impossible paths. - Extreme car stunts andrealistic car driving simulation - Powerful engine for accelerationfor impossible car racing simulator experience -New AmazingDiffrent Cars Buy Unlocking the level -VIP mode also Available-High Resolution Graphics -Smooth Amazing Car Controll -Better UserUnderstanding UI -Reality Phisics -Beautiful Senerio with DiffrentLevel -Diffrent Type of Camera View As per User Comfability You CanModified Car and Controll.Also a Part of Garage that makes your caras per your choice like Color , Wheels , Rims , Etc. VIP Mode :-Now You Don't Have To pay for Unlock Your all Cars with VIP mode.We are give you a all VIP mode function in this game AbsolutlyFree.....!! THE MOTO BIKE TRAFFIC RIDER is an exciting andchallengingmotorcycle racing game , Navigate your motor on a crazystreetracer track.The Traffic brings to you one of the mostcompellingand satisfying traffic dodging experience. then you haveto jointhis game, combined with realistic motorcycle physics, sothat youenjoy the speed while experiencing the realmotorcycleexperience.In this motorcycle racing game, you will havetheopportunity to drive different racing motorcycles to completemanyawesome and challenging motorcycle racing game missions.youhave togo beyond the traffic cars, trucks, buses, heavy trailers,etc., toget gold coins to buy the most beautiful and powerfulmotorcycles.As much as possible to avoid the vehicle, earn extragold coins.THE MOTO BIKE TRAFFIC RIDER Fetures :- - 4 Diffrent typeofFabulous Bikes - 3 Diffrent Type of High Graphics Seneriyo -StantViewe Fetures Also Availebel - Rear Wheel Driving - AmazingandSmooth Controls - User Flaxibility - Global Leaderboard -AmazingSound And Control - atractive camera mode How to Play: - Tapyourphone/tab on right side to race. - Tap your phone/tab on leftsideto brake. - Collect Coins from crossing the traffic by nearandupgrade your motorcycle. - Experience the thrills of realracingand stunts. Normally, you can play all types ofmotorcyclesimulator games. Most of these mobile games take place inthe cityof the world. This is also very interesting thing, but nowis thetime to put your motorcycle on the road! This road trafficrace isfor you to drive a motorbike and travel at the sametimeexperience. Yes we know that it is great. Car Racing Simulator Extreme Track is the best racing game. Bestclassic game for racing where a form to play through so many packedstreets to avoid crashes & take down traffic cars. Here youpick up coins and perform dynamic to perform high-speed aerialstunts! Here you will become to use your all to excellentdriving skills & win. Get on higher performance cars at alllevels. Features of Car Racing Simulator Extreme Track: # ExtremelyPrecise Driving Simulator. # Easy controls mad car drifts. #Breathtaking visuals and amazing cars. # Small size game but reallygood graphics and effects. # Upgrades and customize extreme cars. #HD graphics. # Super fast speed. # Free & endless modes forendless fun Car Racing Simulator Extreme Track is the bestphysics-based single player & multiplayer challenging mission.Best graphics which keeps you make playing all the game in hdenvironment. Have real competition with car racing gameswith real tracks & real traffic racing unlock free nice carsand the test drive to play. Play super cars with easycontrols & upgrade your turbo engine to find the optimal tunefor your car. Can make colorful paints and cool stickers for yourcar with the latest update coming is wi-fi multiplayer racing. Freeclash racing on most impossible tracks with added textures andamazing 3D environments. You can drive with traffic in simple andintuitive control & have amazing 3D graphics. Select from somany cool cars in most accurate physics environment & easy toplay. In a realistic impossible car stunt formula racing games toplay anytime where you get ultimate speed to in racing mode or on amega ramp. Show your f1 racing skills with exotic cars. There is nolimit in playing in levels as you play as the tracks getchallenging in formula racing with impossible tracks in thatextreme time limit. You can race among fast-paced battlesthrough online experience. Ger the real feel of driving andracing on so many similar highway road. Hit the roads withawesome cars and share the experience with your friends with thespeedy formula you have got in this Car Racing Simulator ExtremeTrack game Download, Play, Share and don't forget to give us areview for Impossible Car Racing Simulator Extreme Trackgame. 3M Magical Math Matches a classic puzzle game with 100+ puzzleswithsimple mathematic solution Use all matches to find therightsolution. solve math puzzles by moving matches.Every matchespuzzlelevel is different with logic to move matches. They arecarefullymade and manually checked, so they are correct. Get readyto workwith your brain and get solution of matches puzzle becauseit’s notsolve it This 3M Magical Math Matches game with matcheswill bringyou to your childhood days. Features: 100+ brain bustingmatchespuzzle games. No need to high configuration device fordownloadthis game. Multiple way to solve each puzzle, can you findthecorrect one? Levels have all different equations and designs!HDcolorful beautiful graphics, so you will not be bored! Smallgameapp size, no adware, no unnecessary permissions! If you likethisgame, please rate it and leave a comment. Good luck! Have you dreamt of being a firefighter? . With "Fire TruckEmergency Driver” you could become an emergency fire truck driverand save lifes. "Fire Truck Emergency Driver " is an extremedriving simulator game where you goal is to bring your team to thefire zone fast, so put on your fire fighter helmet, find the fireorigin in the city and get ready to drive your fire truck as fastas possible to the right parking spot. Park the fire truck in theright way, control the fire and help people. You must be fast, soavoid the traffic and control the fire in the shortest possibletime. Remember time is not on your side! FEATURES: - 3 models offire truck to unlock. - 3 water tanks to choose - Lots ofchallenging missions -10 extreme and difficult levels. - Full 3Dcity environment with realistic graphics - Simple and easy controlsfor seamless driving - Realistic Ambulance driving physics -Realistic intelligent traffic and parking and driving controls Feellike a fire truck driver with this simulator. Download now for freeand test your driving skills being a fire truck driver! Car game with fast speed high level heavy traffic on endlessasphaltroads. Racing is not that easy in the endless world withcars havingturbo rush driving mode. Overtake rivals with driftracing skills ofa best racer in real racing championship. Supercars on high speedwith most wanted drivers of top auto game arewaiting. Drift throughthe empty lanes to avoid crashing intotraffic racing cars. Carendless chasing in real world of speedracers with top driving gamefeatures, In short its all about carracing, rush driving anddodging the in coming traffic. Choose frommultiple cars Car RacingTraffic Overtake has multiple cars tochoose from. Earn points bydrifting, wining the race and provingyourself to be the best cardriver in this racing game. EndlessWorld Drive your car, dodge thetraffic and beat other racersrecords in the endless worldenvironment Beat your own scoreOvertake traffic cars on the roadwith a close call and earn pointswhich add up in the end of theracer game to beat up old scoreRealistic car physics Press yourpaddle and get the taste of realcar driving game while racing withspeedy racer cars. Top autoswith turbo rush Speed up your car andturn on the turbo rushfeature during the race to win Racing modesHighway traffic racercomes with different arcade race modesendless, beat the clock,Dual and single traffic lanes Unlockachievements Beat your scoreand drive fast to unlock achievementsStunning 3D graphics All carsand environment models are beautifullydesigned Please do rate yourexperience for future improvements andupdates. We will make sureto make it perfect and top quality racinggame for you.